With the regular season and conference championship weekend now in the past, bowl season is right around the corner. The entire schedule was released on Sunday afternoon. Where did UCF and its conference mates end up? Check out dates and destinations below. SMU (7-5, 4-4 AAC) is set to take on Louisiana Tech (6-6, 4-4 Conference USA) in the Frisco Bowl at 8:00 p.m. The game will be televised by ESPN. The key players to watch for the Mustangs will be sophomore quarterback Ben Hicks (3,442 passing yards, 32 touchdowns) and junior receivers Courtland Sutton (1,017 yards, 12 touchdowns) and Trey Quinn (1,191 yards, 12 touchdowns). For the Bulldogs, it will be senior running back Boston Scott (937 rushing yards, eight touchdowns) and junior receiver Teddy Veal (832 yards, five touchdowns). Temple (6-6, 4-4 AAC) comes to St. Petersburg, Fla. for the Gasparilla Bowl, facing off with FIU (8-4, 5-3 Conference USA). The game is set to kick off at 8:00 p.m. on ESPN. The key players for the Owls will be junior running backs David Hood (562 yards, four touchdowns) and Ryquell Armstead (553 yards, four touchdowns). For the Panthers, senior quarterback Alex McGough (2,791 passing yards, 17 touchdowns) and senior receiver Thomas Owens (887 yards, six touchdowns) will lead the way. South Florida (9-2, 6-2 AAC) is heading to the Birmingham Bowl for the second straight year, this time facing off with Texas Tech (6-6, 3-6 Big 12). Kickoff is set for 12:00 p.m. on ESPN. Leading the way for the Bulls will be senior quarterback Quinton Flowers (3,572 total yards, 31 total touchdowns) and senior running back Darius Tice (878 yards, 11 touchdowns). The Red Raiders are carried by senior quarterback Nic Shimonek (3,547 passing yards, 30 touchdowns) and junior Keke Coutee (1,242 yards, nine touchdowns). Houston (7-4, 5-3 AAC) will travel to the Hawaii Bowl to face Fresno State (9-4, 7-1 Mountain West). Kickoff for the matchup is set for 8:30 p.m. on ESPN. The top producers for the Cougars will be senior receivers Steven Dunbar (873 yards, three touchdowns) and Linell Bonner (850 yards, four touchdowns). On the other side, junior quarterback Marcus McMaryion (2,384 passing yards, 14 touchdowns) and junior KeeSean Johnson (918 yards, eight touchdowns) will lead the way for the Bulldogs. Navy (6-5, 4-4 AAC) is set for the Military Bowl against Virginia (6-6, 3-5 ACC). Kickoff is set for 1:30 p.m. on ESPN. The Midshipmen have been led all year by junior quarterback Zach Abey (2,125 total yards, 21 total touchdowns) and sophomore running back Michael Perry (818 yards, eight touchdowns). Leading the way for the Cavaliers are senior quarterback Kurt Benkert (3,062 passing yards, 25 touchdowns) and junior running back Jordan Ellis (799 yards, six touchdowns). No. 20 Memphis (10-2, 7-1 AAC), the conference runner-up, will square off with Iowa State (7-5, 5-4 Big 12) in the Liberty Bowl. The game will kick off on ABC at 12:30 p.m. The Tigers have one of the top offenses in the nation, led by senior quarterback Riley Ferguson (3,971 passing yards, 36 touchdowns) and senior receiver Anthony Miller (1,407 yards, 17 touchdowns). The Cyclones get much of their production from sophomore running back David Montgomery (1,094 yards, 11 touchdowns) and senior receiver Allen Lazard (799 yards, nine touchdowns). No. 12 UCF (12-0, 8-0 AAC), the AAC Champions, are headed for the Chick-Fil-A Peach Bowl to take on No. 7 Auburn (10-3, 7-1 SEC). Kickoff is set for 12:30 p.m. on ESPN. 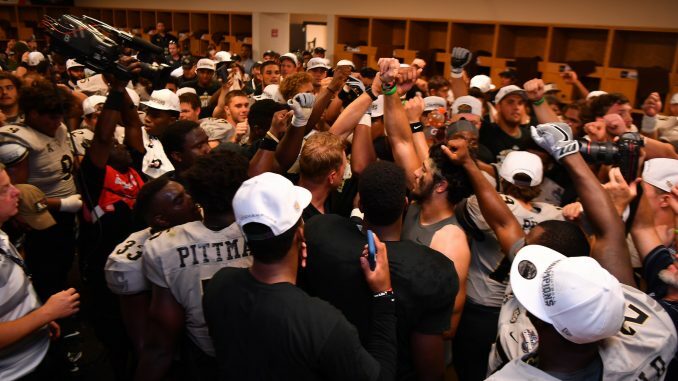 Sophomore quarterback McKenzie Milton (4,292 total yards, 42 total touchdowns), sophomore running back Adrian Killins (762 rushing yards, 10 rushing touchdowns) and redshirt junior receiver Tre’Quan Smith (1,082 yards, 13 touchdowns) are leading the way for the Knights. For the Tigers, it’s junior running back Kerryon Johnson (1,320 yards, 17 touchdowns) and sophomore quarterback Jarrett Stidham (2,827 passing yards, 17 touchdowns). Last December, UCF fell short against Arkansas State in the Cure Bowl. The AAC as a whole went 2-5 in bowl games last year.